Yellow Fever: What do you mean I can’t get vaccinated? I have a friend who is going on a mission trip to South America soon and has been “cautioned” by the CDC (side note: if the CDC is “cautioning” anything, is that really a “caution” anymore? Or more like a, “Hey, the milk in refrigerator is now in solid form and smells like feet, so I’d caution you against adding it to your cereal” kind of thing?) to get vaccinated for both yellow fever and malaria. Edit to add: Evidently, he got clarification that Yellow Fever isn’t in the country he’s going to, only Malaria. So problem resolved. Though apparently Malaria shots really hurt. Yellow fever, by the way, is a hemorrhagic viral disease passed by mosquitos. Because I know you were curious. Anyway, there’s apparently no specific treatment (other than symptom relief) and–not surprisingly–most often found in people who haven’t been vaccinated! Thank you, Wikipedia. Thank you. It has a nasty tendency to cause epidemics, as was seen in America during the 19th century. Supposedly–and I’m basing the following comment on something I saw on television, so take it as you will–the Confederacy had such a horrible time getting quinine and morphine (neither of which are used to treat yellow fever, as far as I know) due to the blockades, that it was smuggled by women and children through the lines and into camp. Is there truth to that? I don’t know. I’m too lazy to look it up online, but you get the picture. 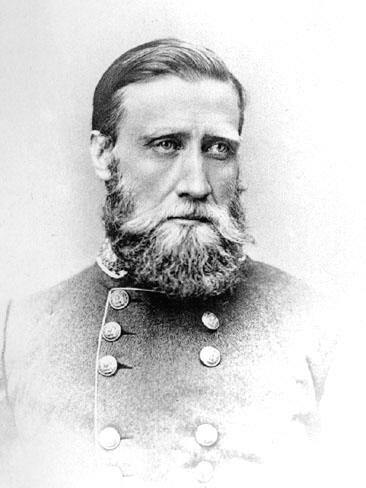 John Bell Hood, Civil War General and longstanding member of the “Civil War Gents Heather Hambel Curley is Infatuated With” roster, died of yellow fever in 1879 while living in New Orleans. He died a few days after his wife and oldest child, leaving behind 10 orphans. And on a side note. Because, again, I know you’re curious. I will never forget my Civil War class in college, when my professor (Dr. Norberg, who was amazing) relayed the fact that JBH had both an arm and a leg amputated during the war, and went on to father 11 children in ten years. I don’t know why that has always stuck with me, out of all the things I learned in college–or ever learned–about the Civil War, but there you go. Look at those brooding eyes. Fabulous facial hair. I’m onboard with that. Soo, yeah, I know what you’re thinking. Weird. I like to think of it as “unexceptionally awesome.” But yeah, I embrace weird too and unapologetically fly my freak flag for JBH and his spryness. Spryness. Evidently he got clarification and the country he is going to is not one affected by Yellow Fever, only malaria. That’s in the bag and he’s good to go!